Often times we meet couples that are very busy with their careers and day-to-day lives, with little time to dedicate to the time-consuming task of planning a wedding. This was the case for Nadia and Don, two busy professionals in Toronto. Nadia and Don came to the Blue Hummingbird seeking full planning and design services for their winter wedding. Through consultation they expressed their desire for a day that was romantic and glamorous. 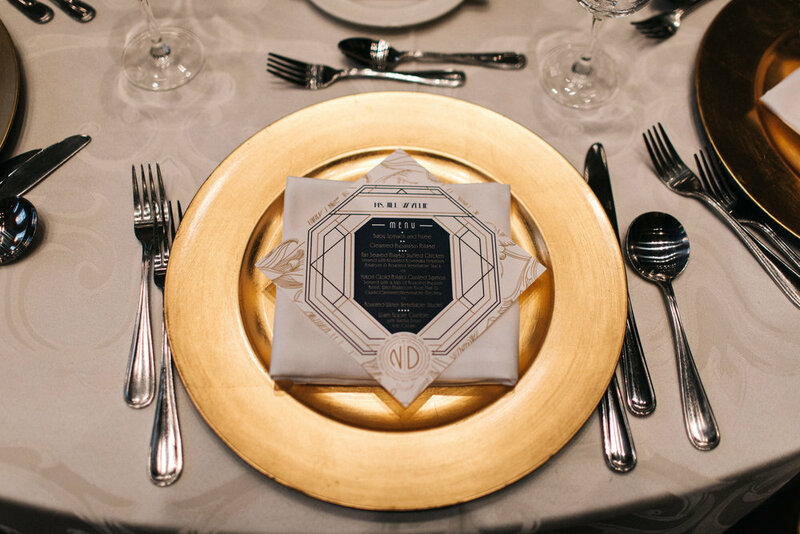 Combined with their selected venue of One King West – a 1914 Beaux Arts gem nestled in the heart of the city – we knew that we could evoke this feeling with a theme inspired by the era of 1920’s, using Beaux Arts, Art Nouveau and Art Deco elements. For us details mean everything! 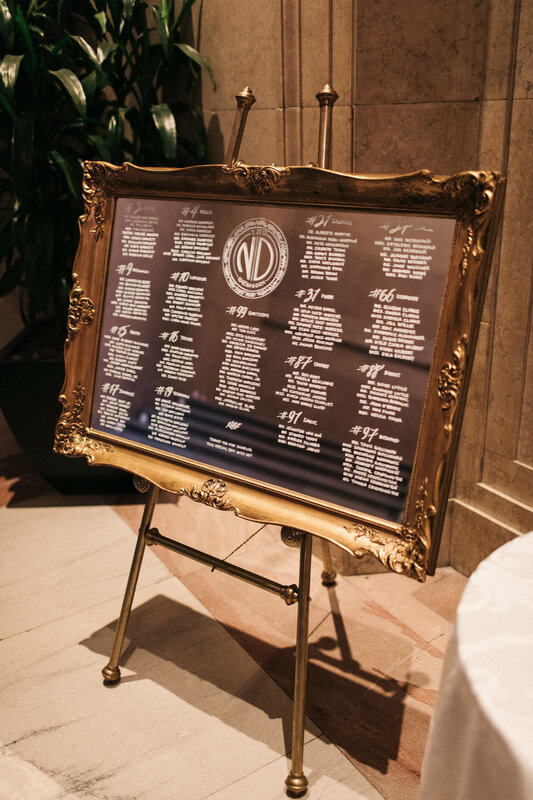 So, from the Art Nouveau-inspired invitations to the custom-designed Art Deco poster and head table backdrop, we sought to transport guests to this bygone era. An Art Nouveau-inspired invitation, using the old world formality of a custom-designed wax seal. (Invitation photos taken by the Blue Hummingbird). We created an intimate atmosphere with dimmed lighting and candlelight, accompanied by delicate floral elements by Enchanting Flowers. We combined the groom's love of hockey with the bride's love of cake, using some of his favourite hockey players and her favourite dessert as a unique way to display the table numbers. Beautiful calligraphy on glass done by Paula Lee Calligraphy. It was a lot of fun designing the art work for this wedding - particularly this large scale poster of the couple. Smaller postcards were created for guests to take home. Menu cards were personalized for each guest, which added a personal touch. The One King West Grand Banking Hall is just that - Grand! We created a head table to draw guests' eyes to the couple of the night. The Blue Hummingbird custom-designed an opulent ivory and gold backdrop, complete with the couple's monogram. One thing we love to do for members of a bridal party is having their partners seated with them. We were able to accommodate this with a u-shaped head table, draped with lush garland and flooded soft candlelight. To make this table extra special, each chair was adorned with delicate strings of pearls. Guests were greeted by the warm flicker of candlelight as they entered the Grand Banking Hall, along with selections of Jazz from the bride and groom's personal collection. Oversized balloons with gold and ivory tassels filled the late night food station area. And of course, no party is complete without a rockin' dance floor! Guests danced into the early hours of the morning to the sounds of D'Enforcas. All photography by Jennifer van Son Photography, except where noted.